Many observers have been expecting a second 9/11 or a new Gulf of Tonkin incident as a pretext for war against Iran. With announcements that a new surge will result in the doubling of troop strength in Iraq, ships filled with 17,000 sailors and marines entering the Persian Gulf off the coast of Iran and war games that culminate in an amphibious landing in Kuwait, the Bush administration is making its move to escalate this war without end. Bush stared the punk Democrats in Congress down, and they sold the American people out again by agreeing to continue funding his wars. 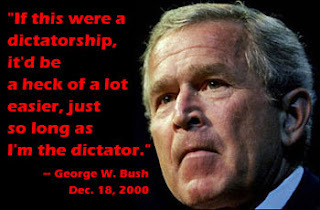 With all of administration’s abuses of power, the Dems should have impeached Bush and Cheney long ago. The fact that they still cower in his face is telling. This new directive along with the Military Commissions Act of 2006 and The Insurrection Act of 2006 set the stage for a dictatorial takeover if any emergency arises, from a “terror attack” to a sunk aircraft carrier to a hurricane. But don’t take my word for it. Read the information for yourself.